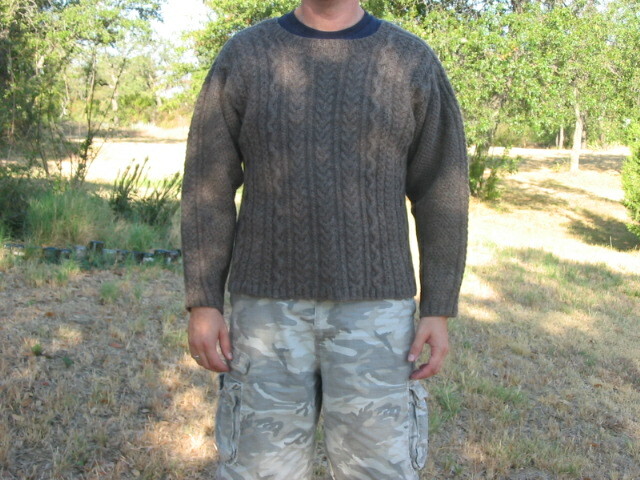 Finally, pictures of the finished Dirt Sweater (aka, the FLAK sweater). It really is the exact color of the dirt in our yard. 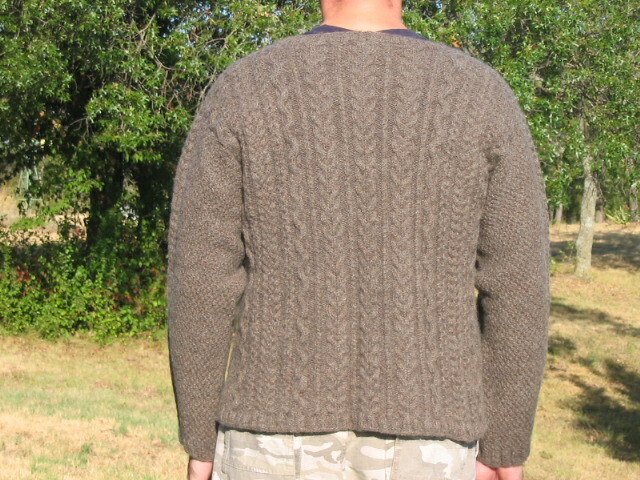 I have to wonder what the people who name yarn colors are thinking--mocha heather? Dirt heather. But I like it, and more importantly, so does the Boy. 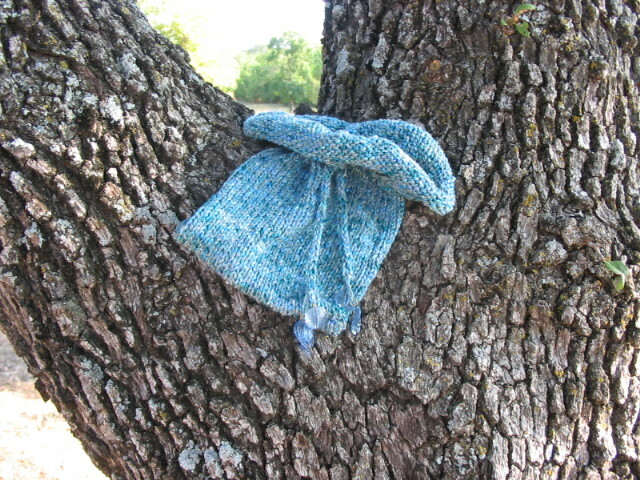 I did find that the yarn got very fuzzy during the knitting of this--almost like it was fulling on its own. 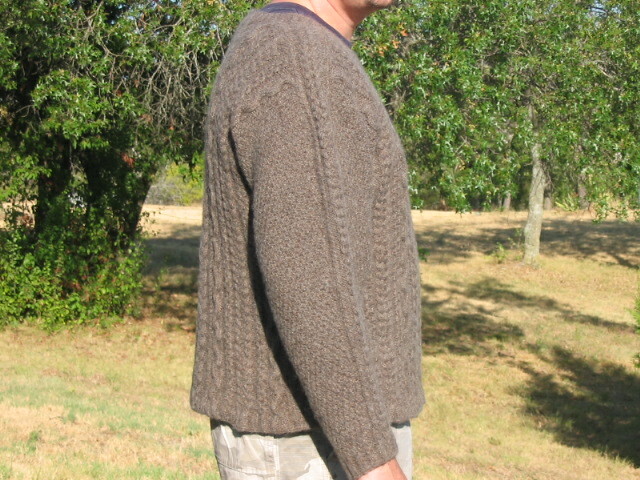 As the sweater is meant to be a heavy outdoor work sweater, we'll call that good. One thing I would have done differently (had I but known) is to work less extra material at the armholes. Assuming that the Boy wears the sweater over a long-sleeved shirt, however, the bulk around the armholes may be less noticeable. I also would have been more careful when picking up stitches for the sleeves. I don't like the fact that there almost appears to be a seam line there. 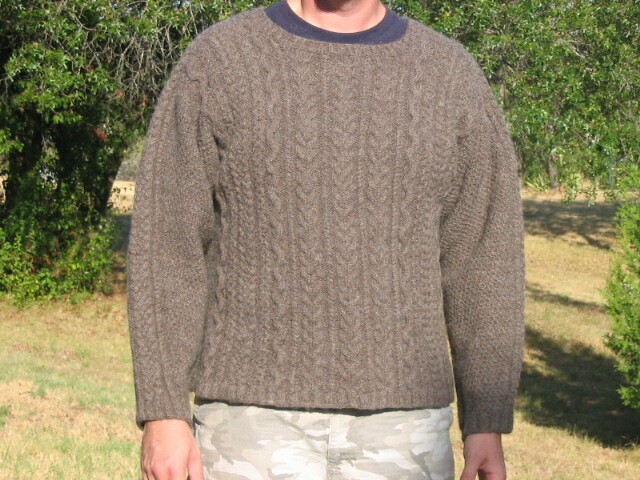 All in all, though, I'm happy with how the sweater turned out, and I learned a bunch about the design and fit of aran sweaters. Janet Szabo did an excellent job of explaining the concepts step-by-step, and she didn't leave out what to me is the most important part of any instruction--why things are done the way they are. I'll now be able to take this knowledge and apply it to other types of sweaters. Thanks, Janet! I really wish there were more designers willing to teach this way, via the internet--it's something I'd happily pay for.